Do feel stifled by your current job or feel like you’ve settled for less than you’re truly capable of? Are you yearning to do work that lights you up… but you’re not exactly sure what it is? Yep, I’ve been through it and know the pain of not knowing what the right next step is. But here’s something I’ve always known is true: we all have certain gifts we’re meant to express during our lifetimes and it’s really important that you do! Discovering what those gifts are and how to leverage them into a career or entrepreneurial business that not only feeds your soul but also rewards you financially can be a journey so confusing and frustrating that many give up trying to figure it all out. How do you discover the gifts you’re meant to share and start to fully express them in a way that’s right for you? That’s what this post is all about helping you do. From 2007 to 2009, I was working with T. Harv Eker, a best-selling author, personal development guru and super-successful businessman and author. I absolutely LOVED the work I was doing! But then I decided I wanted to become a mom and because that job involved so much travel, I decided to quit so I could stay home with my new son. When I got to the point that I started feeling like there was something more that I needed to do and I did what a lot of women do and latched onto whatever was around me, which led to full-time volunteering. That kept me busy enough for a couple of years that I could ignore the dissatisfaction I still felt inside. I was busy, but not fulfilled. I felt this need to do something more. I felt I wasn’t fully expressing myself or my gifts and that there was a bigger step I needed to take to express my creativity. So, I actually took up a baby project: inventing a new baby bib! And, I worked on that project for several years while volunteering and being a stay-at-home mom. Again, though, I was just keeping myself busy and the baby bib project lingered without me really fully dedicating myself to it. Then the turning point came: I went to a women’s business conference and when I’d talk about the work I’d done with Harv to create and launch new programs, I lit up and would babble on sharing tips and strategies for successfully launching live and online programs. More and more people kept telling me, “Forget the bib! You need to share these things that you know about creating and launching programs. People need that!” Eventually, enough people said the same thing that I started wondering why I wasn’t yet doing it and that was the beginning of the business that I now have. Although it took me several years to discover the gifts I’m meant to share and start doing it, it doesn’t need to take you that long! Here are key steps for uncovering the skills you’re meant to share to the world. People telling you that you’re really good at something, especially when it’s not something that you’re doing right now, is one of the tell-tale signs you’re not doing what you’re meant to be doing. Maybe you’re discounting your unique gift as a “real” skill or thinking that it’s not something of value to the world because it comes easily to you. We often think that just because something is easy for us to do that it’s also easy for everyone else, it’s not a valuable skill or it’s not worth sharing. On the contrary, when something comes easily to you, that’s a huge sign that it IS a gift you’re meant to share! Too often we discount our gifts and diminish their value because of a cultural belief that we have to work hard for our money. The corollary is that if something comes easily to us, it must not be valuable or we shouldn’t charge much for it. To continue with the story, after I decided to launch my business, my fears came up and I went into self-doubt. I thought, “Well, I’m not really an expert. Yes, I have experience and did all these great things, but I don’t have letters after my last name, I’m not a guru, I’m not a best-selling author.” But if you’re going to launch your own business and succeed at it, then you have to work through those doubts, just like I had to. When you work for someone else, you’re often the behind-the-scenes person like I was for T Harv Eker, or you’re a part of a team, or you’ve got the company’s name and reputation backing you up. But when you launch your own personal brand business as a coach, healer, author, speaker or practitioner, now the spotlight is on you… and that can be disconcerting or scary. At the beginning I often asked myself, “Can I really be the person who is helping other people? Can I be the person standing in the spotlight?” The answer is yes - for me and YOU! Even if you’re just starting out, even if you’re not a superstar just yet or the top person in your field, what you know, your unique life experiences and your gifts can and will help a lot of people. If you can keep that in mind that there are people who want and need what you can provide, it will help you get over your fears and take action from a place of service and contribution to the world. Even now I’m discovering new layers of how I can help people through the process of working with them. Discovering your gifts is a journey that will continue to unfold as you do your work in the world. You’ll get clearer on what your gifts are, what fulfills you and brings you joy, and what benefits the world as you get into the act of doing your work. Along this path of uncovering and discovering what your gifts are, there will be many iterations. There will be pivots. You will make adjustments. Tap into your intuition to help guide you as you go. You may have a kind of a divine moment when your questions are answered in your head. Or the guidance you need will come through feedback from your friends and the world around you, just like when I was at the conference where people asked me why I was messing around with a baby bib business. To help you get clearer on your gifts and what you’re meant to do, I’ve put together a series of questions. Set aside 10 - 15 minutes to write out the answers. What gives you joy? What do you absolutely love doing? What comes easily to you? What are some things you do really well but maybe you’ve discounted its value in the business world? What have other people complimented you on or told you you’re really good at? What do people often come to you for advice on or help with? Where your passion, gifts and talents and other people’s wants and needs intersect is your business sweet spot. Start off by making a list of what people want or need that’s in some way related to your gifts and talents. What problems or struggles do people have? What kind of solution do they want or need? 1. What gifts do you have that you feel are untapped? 2. What are some of the ways you could make money with your skills and abilities? People not buying what you're offering? You need the right words to communicate why clients should work with you. 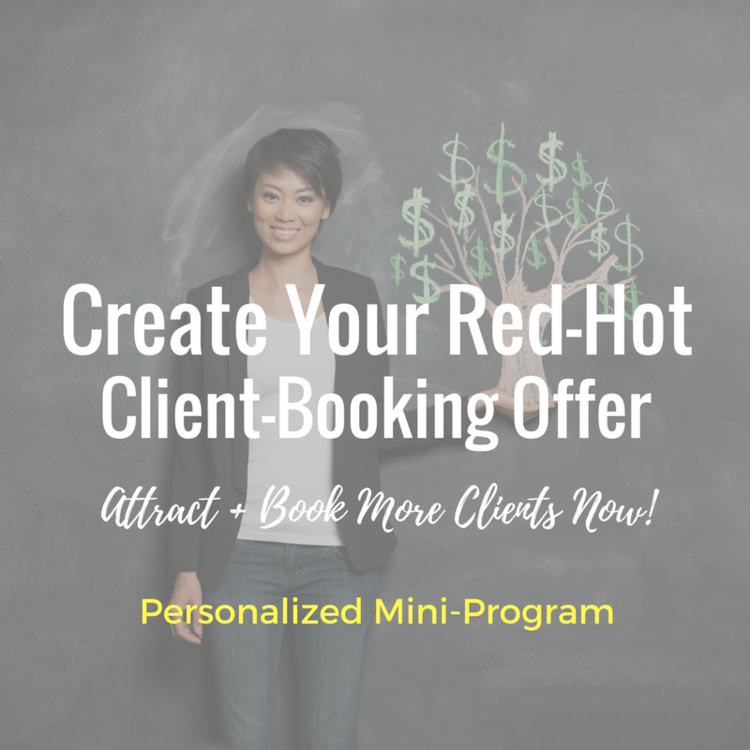 Nail down exactly WHAT to offer and HOW to communicate it so you attract and book more of your ideal clients... even at higher rates. Click Here Now.